Adjusting lights and shades from a smart phone has never been easier, more reliable, or affordable. Experience the ultimate convenience with the Lutron Caseta Wireless dimmer, Pico remote control and Smart Bridge. The wireless dimmer gives you the ability to set the right light for any activity whether it's reading, watching TV, entertaining, or having a casual dinner. The dimmer works up to 600 watts of incandescent or halogen and 150 watts of dimmable LED or dimmable CFL. Control the lights from anywhere in the room by using the Pico remote control by mounting the remote directly to the wall for multi-location dimming. No cutting holes or wiring required! 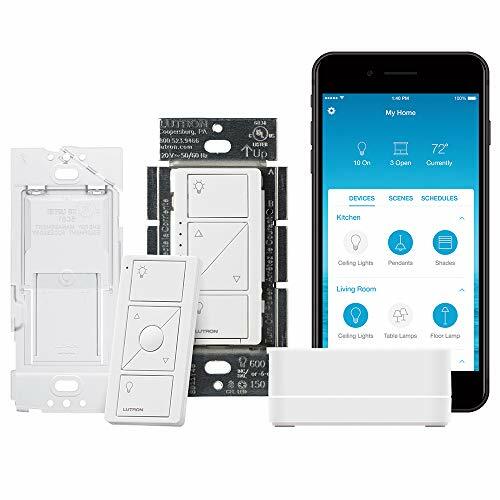 Use the Lutron Smart Bridge and App to control lights and shades from anywhere, schedule them to adjust automatically based on the time of day, or create your favorite scenes that adjust multiple lights and shades with the press of a button. This kit includes (1) Smart Bridge, (1) Caseta In-Wall Dimmer, (1) Pico Remote Control (1) Pico Wallplate Bracket.